No other historic architectural style has as many alternative names as the Tudor Revival does; Elizabethan, Jacobean, Jacobethan, Queen Anne, Old English, and Cotswold are a few. Although there are many names referring to the same style, Tudor Revival has become the most accepted term in the academic community and in general for its immediate association with the structures that are their source of inspiration - the medieval buildings of Tudor England. Classic characteristics of Tudor homes include elements such as steeply pitched roofs and gables covered in slate or imitation thatch, bays of casement windows of diamond-paneled leaded glass, lustered chimney stacks, interiors of wood paneling and parted ceilings, and especially half-timbered and stuccoed facades. 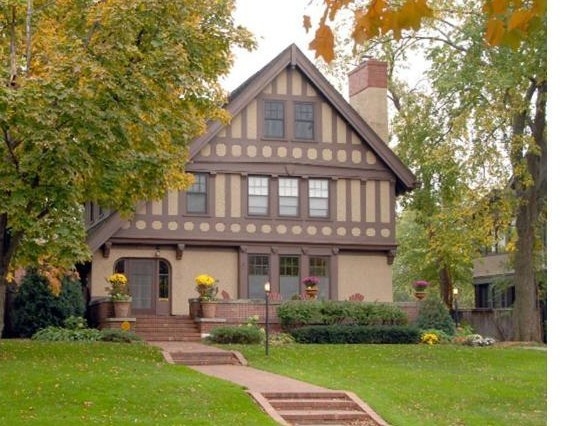 The Tudor Revival style developed in America between 1890 and 1930. Culturally, this style was meant to be patriotic; a style with roots in America’s colonial past and even farther back in late-medieval Britain with its associations of aristocracy, genteel living, stability, and dynasty. At a time where American cities were overflowing with immigrant groups, those born here, the Anglo-Americans, wanted to set themselves apart as suggested by the Tudor style. Arts and Crafts movement’s anti-industrial ideal made popular by the writings of John Ruskin and William Morris. The first authentic American versions of Tudor homes were built in the 1880s. The styles were originally drawn from humble medieval cottages. Designs such as the low doors and windows with thatched roofings from the Cotswold stye led owners toward the Tudor style through the years. Tudors can still often be seen in suburbs from coast-to-coast.